Duviella, E.; Rajaoarisoa, L.H. ; Blesa, J.; Chuquet, K.
Duviella, E. [et al.]. Adaptive and predictive control architecture of inland navigation networks in a global change context: application to the Cuinchy-Fontinettes reach. A: IFAC Conference on Manufacturing Modelling, Management, and Control. 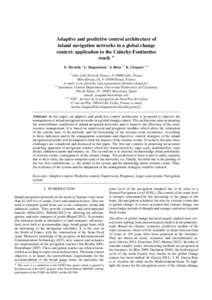 "Proceedings 7th IFAC Conference on Manufacturing Modelling, Management, and Control, MIM 2013". Sant Peterburg: 2013, p. 2201-2206.